Work hard, rock hard, eat hard, sleep hard, grow big, wear glasses if you need 'em! The Webb Wilder credo- what is it? A: "Work hard, rock hard, eat hard, sleep hard, grow big, wear glasses if you need 'em!" The true story dates back to the first out of town gig in 1985. It was Easter weekend, we'd been at George Street Grocery in Jackson, Mississippi. R.S. "Bobby" Field said, you know you're going to start doing interviews. He got out a boombox and we started recording a practice interview. At the end he said, "Is there anything you'd like to add?" and Webb said, "work hard, rock hard, eat hard, sleep hard, grow big, wear glasses if you need 'em!, the Webb Wilder credo," and that, was that. Webb says that he's been living this all his life, and in verbalizing it, he realized he'd be living it the rest of his life. It's an economical bit of philosophy- the questions are complicated and the answers are simple. And if it don't work, the rest will take care of itself. 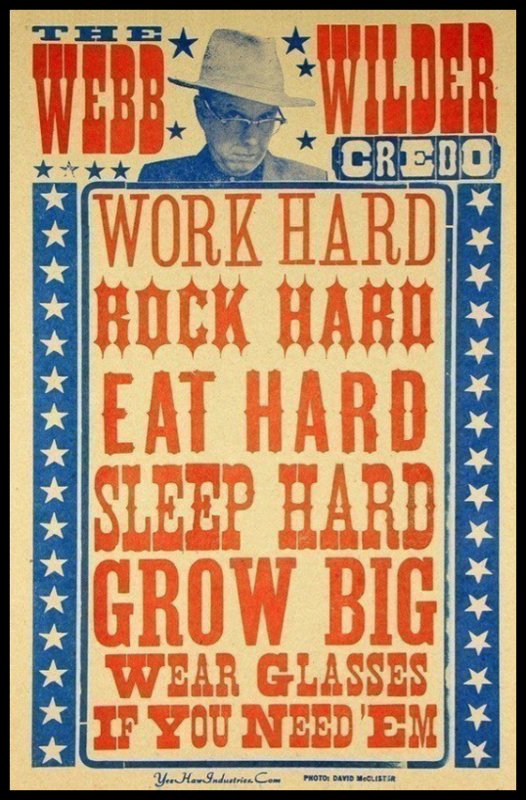 Here's a sampling of the Webb Wilder credo. There are many ways to say it but only one way to live it! Who Is WW Who is Webb Wilder?